On Thursday, April 25th I’m taking the Path Train to the Grove St. Station in Jersey City to play a solo gig at the Atlas Public House. Every Thursday from 7:30 to 9:30 my friends Joey Kelly and Jimmy McElligott host a night of music in the very comfortable back room there. Great sound, food and drink. On the bill with me is Jana Peri. The Atlas is only a few stops on the Path Train so I hope you’ll get on board and head over to Jersey for an evening of music, food and fun! The band is back at An Beal Bocht this coming Friday night for two sets beginning at 9pm. It’s one of my favorite places to play and one of the coolest bars in the city. I hope you’ll join us. The fun starts at 9pm and goes to 11. We’ll play two sets. Come early for dinner and stay late and enjoy the music! No cover but they do pass the tip basket. It's time to hit the saloon, Hank's Saloon that is. The Dirty Dishes head to Brooklyn for a Thursday evening one set show. It's a great opportunity for our friends in BK to check us out. 46 Third Ave on the corner of Atlantic Avenue. It couldn't be easier! Of course, fans from the other boroughs are welcome too. Don't be a bum, come! We back at the Sidewalk Cafe as a quartet. Ray Grappone on drums, Randall Klitz on bass, Bill Ferns on harmonica and me. 7pm. Sidewalk Cafe is located at 94 Avenue A at 6th Street in NYC. You can eat, drink and listen to music. All ages are welcome! The band is playing at the Sidewalk Cafe tonight at 8pm and we’d love to see you there. I know it’s cold and there’s a storm coming but think of it as a pro-active cure for the cabin fever that’s sure to follow. That’s right, get out while you can! The band will be in full force with Stephen Benson on guitar, Ray Grappone on drums, Randall Klitz on bass, Jonathan Gregg on pedal steel guitar and Greta Tristram on harmonica. Sidewalk Cafe is located at 94 Avenue A at 6th Street in NYC. You can eat, drink and listen to music. All ages are welcome! My band is back at An Beal Bocht this coming Friday night for two sets beginning at 9pm. It’s one of my favorite places to play and one of the coolest bars in the city. I hope you’ll join us. The fun starts at 9pm and goes to 11. We’ll play two sets. ​Bluescraft at Lovecraft NYC. Full band on at 7:30. Special guest Bill Ferns aka Kid Java on harmonica. 50 Ave B at 4th St.
Hey everyone. The band is returning to An Beal Bocht Cafe on Sunday, August 6 for two sets starting at 8pm. Come hear songs from our recently released album PERFECT ON PAPER as well as new material and some classic covers. It's all happening in Riverdale, the Bronx! Jim Petrie: vocals, guitar; Stephen Benson: guitar; Ray Grappone: drums; Randall Klitz: bass guitar; Jonathan Gregg: pedal steel guitar. 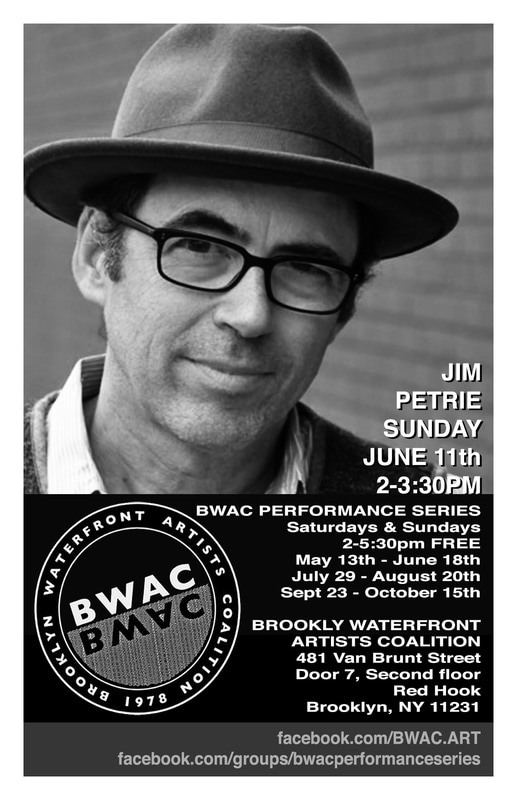 I’m playing at the Brooklyn waterfront in Red Hook Sunday, June 11, from 2 to 4pm as part of the Brooklyn Waterfront Artist Coalition (BWAC) music series. Check out their website for tons of information on all the things they do there to support the arts and make Red Hook such a great destination place. http://bwac.org Right next to Fairway and close to IKEA I’m performing in a space that is well used by musicians and artists alike. Come early and enjoy the very cool restaurants, bars, shops, garden centers and art galleries around the waterfront or just enjoy the view of New York Harbor and a little music. The address is BWAC Exhibition Space, 499 Van Brunt St. 2ND FLOOR, Red Hook, Brooklyn. As if I haven’t given you enough links to click on already here is the Brooklyn Waterfront Artists Coalition’s Facebook page: https://www.facebook.com/BWAC.ART/?fref=nf Like it and come! Hope to share a little of your Sunday with you and thanks for your support! I'm playing a solo set up at Silvana as part of my good friend Paul Fairall's residency. We're making music from 6 to 8pm. I'm on at 7.